As someone born on Chanukah, I feel a certain connection to this holiday. 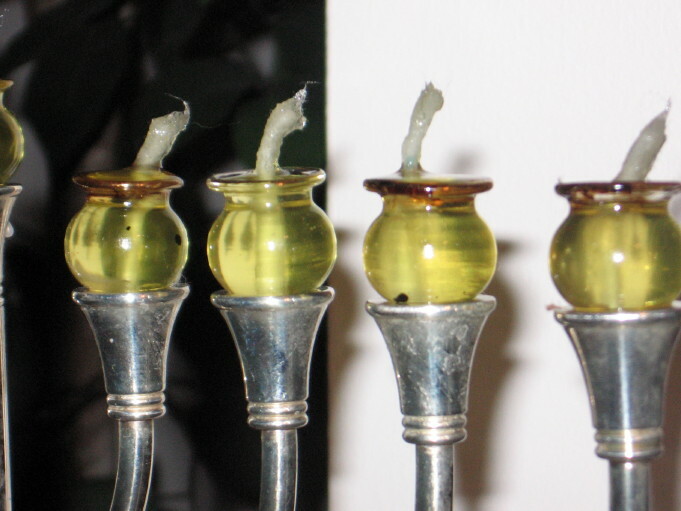 I have always wanted to use olive oil to light the menorah, however our simple silver menorah was designed only to hold candles. To rectify this problem, I bought small glass adapters to fit the menorah before Chanukah this year. Using olive oil for the first time made lighting the menorah particularly special. I am still going to try to improve upon it next year since my size 1 adapters only hold enough olive oil to last for 35 to 45 minutes. 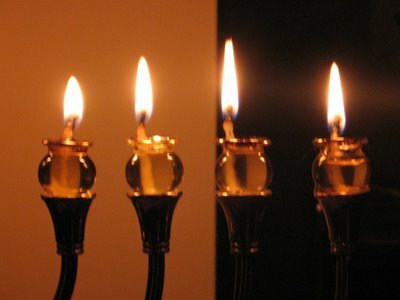 I am searching for adapters that will fit my menorah and will hold enough olive oil to burn for an hour or more. My wife thinks that I am "being obsessive" about all this olive oil and wick business. ....and maybe she is right. I am still wondering whether a size 2 or size 3 adapter will fit the menorah, and if I should use something other than simple cotton wicks. I wonder whether Soccer Dad has any advice on this since it appears that he too is an olive oil maven. How easy and simple this world of ours can be if only we do not give in to idleness. And how dark and difficult it can be if we do. "We need to go get some more chocolate pennies. We are all out!" "I'm going to HonKA Wonderland." "Antiochus - he is VERY BAD!" "I am a Maccabee soldier fighting for Hashem." "Daddy, I wanna watch more Yom Kipper!" When a Jew sings me a niggun, I can tell his level of yiras shamayim. I find that everything changes. I am no longer an individual, I am a father. The single most decisive force in decisions, in time usage, in finance - in everything - is the fact that I am a parent. As a child I looked at my father as grown up, old, experienced, knowledgeable, worldly, wise, in control, and above all, the man with all the answers. If my father didn't know, than no one did. Little did I realize that fathers are often not all that old, of limited experience, with only selective knowledge, often unworldly, prone to mistakes, only wish they could be in control, and often without a clue. That's probably because I'm not as good a father as my father is, but it also means that my children look at me similarly, and although this is unreasonably and unfair to me, it remains my responsibility to try to live up to some of the expectations... Who knew that "the dad" isn't necessarily fully prepared for the job? We would never hire a pilot who wasn't fully trained to fly a plane, but dads don't get any prerequisite degree for the job. I only wish I was keeping my end of the bargain reasonably well. Do you find that you are able to give individual attention to each of your six children? Unfortunately, I have no idea how to give the individual attention each child needs, and especially to the children who need it more than the others. I felt like was doing ok, and mostly in control of things when I only had three children, but when we had our fourth child I instantly felt like the dam broke. Parents have limited time, limited energy and limited recourses. How is it possible for parents to devote this fairly and adequately to a large family? I don't really know. I remember spending an hour a night on homework with my oldest child. But with each additional child, that is not a possibility anymore. If I have 30 minutes for a child in a night they're lucky and to which child should I devote it? When a couple children demanded my attention, I could usually juggle it; but with six kids demanding it, I am often drained and overwhelmed which doesn't benefit anyone. I don't want to sound negative; I try my best (at least I'd like to think so), and I am very proud of my kids and their successes but if you ask me, "Do you find that you are able to give individual attention to each of your six children?" I would have to say, "I WISH!" I think we'll have to ask THEM, say, in about 15 years. A child's character education should take priority over his academic education. All education efforts are basically meaningless unless built on the solid foundation of good character. 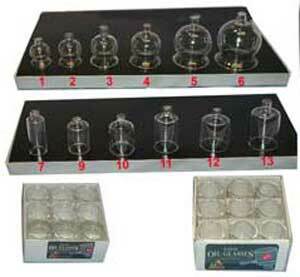 "The eight glass vials were filled to the brim with olive oil. In each a wick stood proudly waiting to be lit. It is the eighth night of Chanukah, our Festival of Lights and our holiday of miracles. Hundreds of residents of Neve Dekalim and surrounding communities gathered in the parking area of the enclave known affectionately as 'mortar neighborhood'. Each vial of oil was placed in the tail of a mortar shell that had fallen in that fifty square meter radius of homes and gardens. Shells that were meant to injure and kill were used instead to fashion the Jewish symbol of life and dedication to the Almighty, the menorah. The shells had been collected and soldered together with an enormous chain , a chain signifying the Jewish people. A Magen David, our Jewish star with the word chai, life, was carved into its centered. The Hebrew month and year, Kislev 5765, was engraved into its base." The Maccabees insisted on using the pure oil for the one day and not being concerned about what they would use the following day. They believed that they must do what is most proper today, and leave the future for G-d. This attitude merited a Divine miracle. While everyone has heard of Abraham, Isaac, Jacob, Joseph, and Moses, some people may not recognize the names Avraham, Yitzchak, Yaakov, Yosef, and Moshe. Yet these were there real names! What gives English speakers such difficulty referring to biblical figures by their real names? Is it the fact that they have never heard a Christian refer to Moses as Moshe or Elijah as Eliyahu? Yitzchak Rabin was Yitzchak Rabin - the English press never changed his name to a more pronounceable "Isaac Rabin". Since we don't Anglicize the names of others with "funny" names like Kofi Anan, Boutros Boutros-Ghali, Mahmoud Ahmadinejad, or Usama Bin Laden, why do we need to Anglicize the names of biblical figures? I have no problem with someone referring to brochos as "blessings" or davening as "praying", but a name is a name! Why can't Abraham just be Avraham? Humans need a great deal of wisdom to be simple. The sefer Sheulos U'Teshuvos Meil Tzedakah was printed in my family's shtetl in 1835 on blue paper. Even though I used Auction Sniper, I still did not win it when the auction closed Tuesday on eBay. "A separate but unrelated phenomenon, often confused with the earlier convention of deluxe printing on blue paper, took place in Eastern Europe at the end of the eighteenth and in the early nineteenth centuries. 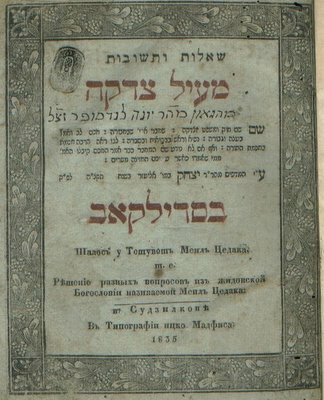 During this period, books were issued on 'bluish' paper by Hebrew printing houses throughout the Ukraine, White Russia, and Lithuania. Cheap blue-tinted paper, inferior in quality to white paper, was widely used by indigent printers in towns such as Dubno, Jozefow, Kopys, Koretz, Ostrog, Poryck, Slavuta, Sudilkov, Vilna, Zhitomir, and Zolkiev. 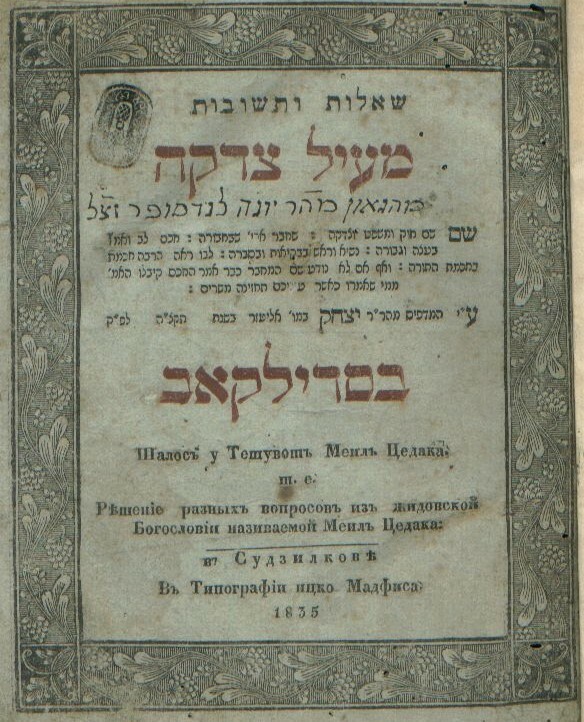 Thus, unlike the blue-paper books of earlier centuries, the Eastern European Hebrew books on bluish paper were not deluxe copies; indeed, a major portion of the Hebrew book production was on this paper. There are, however, a few Eastern European imprints on blue paper which do appear to be deluxe copies, or seem intended to be appreciated for their aesthetics. Sometimes it is virtually impossible to distinguish between the economical use of bluish paper, and the intentional use of blue paper for aesthetic reasons, and it is likely that in some instances the two motives coalesced in the production of a book. As the Hebrew poet Bialik once noted, the Eastern European books printed on bluish paper had a great influence on the mind and imagination of generations of Talmud students. It is these Eastern European editions, if not the earlier deluxe copies from Italy or western Europe, to which the Yiddish novelist I.B. Singer drew attention in a memorable phrase, 'blue as the leaves of old Hebrew books.'" I am grateful to Brad Sabin Hill and Dan Rabinowitz of Seforim for all the information they have provided me on seforim printed in my family's shtetl. Collecting these seforim has opened up a whole new world for me. I realize there is still so much more to learn. eBay description: Responsa Meil Tzedakah. Printed in 1835. Nice book. Blue paper. With many illustrations. Some handwritten notes on the margins. Some wormholes, but mainly good. In one page some lines missing by tape. I would encourage young people who are building seforim collections to include some older editions, if only to preserve them for the future generations. Providing a tangible link to the giants of the past, these seforim will be objects that our children and grandchildren will treasure. Standing on the rooftop of the dorms at Tel Aviv University that summer night in June, I felt like someone had just knocked the wind out of me when the radio broadcast the results of the 1992 Israeli elections. After spending a month at Metzudat Ze'ev (Likud Party headquarters) volunteering alongside veterans from the Irgun Zvai Leumi, the news that Yitzhak Shamir had lost was especially devastating. Besides being the party of Vladimir Jabotinsky, I also used to view the Likud Party as the party of the Irgun Zvai Leumi and Lehi. It was a party that was carrying on a proud tradition. The Irgun veterans that I worked with during the 1992 elections cautioned me what would happen if the Labor Party was victorious. At the time, I thought these older men were being overly dramatic, however time has certainly proven them correct in every regard. Territorial concessions, terorrism, and more concessions...all as they predicted. Who knew that fifteen years later that the Likud Party would become virtually indestinquishable from the Labor Party? Who could have forcast that the Irgun veterans would one day look at the Likud Party in disgrace? I have been thoroughly disillusioned with Israeli politics since the Likud Party initiated last summer's expulsion of Jews from Gush Katif and the northern Shomron. In retrospect, Likud governments have done more damage to Eretz Israel than their Labor counterparts. While a Labor government signed the Oslo Accords, Likud governments actually ceded the Sinai peninsula, parts of Hevron, and, the Gaza Strip. The Labor Party always talks about doing all these things, however it is the Likud Party that carries them out. Will the the 2006 elections send the final death blow to the Likud Party? I sure hope so. Ultimately the Likud has betrayed itself. I would love, just once, to get a glimpse of the future for which so many people toil. What Did You Learn In Mezeritch? They asked Rabbi Aharon of Karlin, "What did you learn in Mezeritch?" "Nothing at all" he said. "What do you mean?" he was asked. "That's right," Rabbi Aharon replied, "in Mezeritch I learned that I am nothing at all." Then they asked Rebbe Levi Yitzchak of Berditchev, "Well, what did you discover in the beis medrash of the great Maggid of Mezeritch?" "I discovered that there is a G-d who is the Master of this world and all other worlds." "But, Rebbe, everyone knows that!" "No," Rebbe Levi Yitzchak replied. "They say it everywhere, but in Mezeritch they know it." To learn how to be proud - and not be proud. To learn how to be angry - and not be angry. To learn how to speak - and to remain quiet. To learn how to be quiet - and to speak. Today, the 18th of Kislev, is the yahrzeit of Rebbe Baruch of Medzhebuz. Rebbe Baruch was a grandson of the Baal Shem Tov and also the younger brother of the Degel Machaneh Ephraim. Although he was a great tzaddik, Rebbe Baruch's neshoma was rooted in a place that makes him almost inaccessible to me. 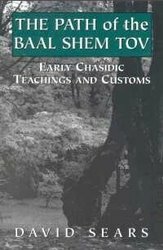 The Toldos section of the 1995 printing of Degel Machaneh Ephraim states, "Two holy souls did the children of the holy Besht bring down into this world, one from the side of chessed [kindness], namely our Rabbi [the Degel], and one from the side of gevurah [strength/strictness] namely Rebbe Baruch, may his merit protect us. And of Rebbe Baruch, it is told that at the time of his passing on the 18th of Kislev, that they found next to him the holy Zohar, open to the page on which is written, "There are different kinds of Anger. There is Anger that is blessed above and below, and it is called Baruch [blessed]". 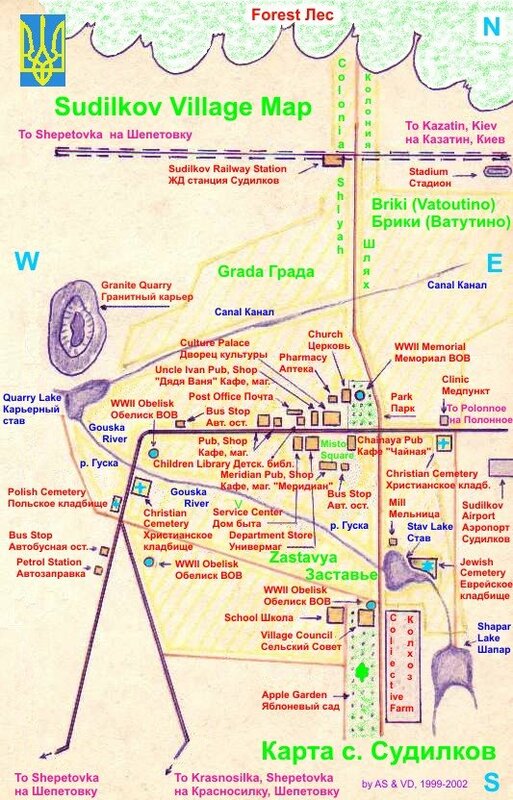 I have visited his kever in Medzhebuz, but did not leave a kvittel there. I have a copy of his sefer Botzina DeNehora on my bookshelf, but I have not yet opened it pages to learn from it. I have had a tough time relating to Rebbe Baruch ever since reading this story many years ago. This problem was further exacerbated when I learned that the Tehilos Baruch [Perek Heh] relates that Rebbe Baruch once cursed the people of my family's shtetl when they did not act nicely towards him. If his teachings are quoted by his older brother in Degel Machaneh Ephraim, why do I still have trouble with Rebbe Baruch? What prevents me from seeing this great tzaddik in a better light? We know that some people are rooted in Chesed and some are rooted in Gevura. We surely relate best to those with whom we share sensitivities, and there is nothing wrong with that. But we should understand that the gevura is not "mean". Reb Baruch was a truly lofty man. As a child he slept in his grandfather's room and listened to Achiya Hashiloni study with the Besht (when the Baal Shem Tov found out, he made him sleep elsewhere). He was raised mainly by R' Pinchas of Koretz and the Toldos Yaakov Yosef - both of whom praised R' Baruch greatly. The Ruziner stated that Yechiel, father of the Degel Machaneh Ephraim and R' Baruch, ascended to heaven to select lofty souls to be his children. He chose the Degel first and then R' Baruch, but R' Baruch's soul didn't want to descend to this world unless all Tzaddikim of the world would be subservient to him, but the soul of the Baal HaTanya refused to do so and this disturbed R' Baruch greatly. We all know of the epic struggle between the Baal HaTanya and R' Baruch, but make no mistake, they each held the other in the highest esteem. Botzina DeNehora is a special sefer even if its not your path, it remains a lofty path nonetheless! Chazal tell us that the words of Tzaddikim are like coals of fire; they can singe or burn those around them. This is certainly true of R' Baruch. R' Baruch once said, "If my grandfather, the Baal Shem Tov, was R' Shimon Bar Yochai, then I am Elazar his son." (Remember that R' Shimon bar Yochai stated, "I have seen lofty men and they are few; and if there are only two, they are my son and myself.") Also remember how R' Shimon and his son R' Elazar caused a man to burst into flames when they saw him desecrate Shabbos. But that does not make them "mean" since often their gevura contains a higher level of chesed. 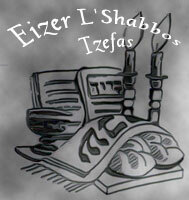 R' Baruch was once sitting with his brother R' Moshe Chaim Ephraim, the Degel Machaneh Ephraim, and R' Asher of Stolin. R' Baruch took a glass of vodka and said to R' Asher, "L'chaim, May Moshiach come." R' Asher responded, "L'chaim, may we go out to greet Moshiach." R' Moshe Chaim Ephraim said to R' Baruch, "L'chaim, May Moshiach come," and to R' Asher he said, "L'chaim, may we go out to greet Moshiach." Then R' Baruch yelled angrily at R' Asher, "Litvak! How dare you deviate from my blessing? Take it back! Litvak! Take it back! May your ancestors to be pulled from their graves!" R' Moshe Chaim Ephraim could not contain himself and he said, "At first I understood your words, but now I don't - what have you against his ancestors!? R' Baruch then asked his brother, "What was your understanding?" R' Moshe Chaim Ephraim replied, "My understanding was that you meant to say that Moshiach should come whether we are worthy or not and R' Asher's blessing was for Moshiach to come, but only if we are worthy. But your second statement has confused me." R' Baruch then said that he had indeed understood correctly, but that the second comment was a completely differently matter, "You see, R' Asher has no sons and I blessed him that he should merit to have a son, and as is known, one's ancestor's come to his bris. So my blessing was that his ancestors should be pulled from their graves to the bris!" And so it was, not long after, G-d helped and R' Asher had a son "the Beis Aharon" who later became the Rebbe of Stolin. Chazal say that through gevura one can give a far greater bracha than through chesed because there are not forces that oppose gevura as they oppose chesed. R' Baruch was able to accomplish great good through his gevura! Zechuso Yagein Aleinu. Everyone was created to right something in this world. Either they owe it to the world, or the world owes it to them. Below is a letter that I wrote to my daughter in May 2004. I plan to give it to her one day when she is old enough to understand. The Baal Shem Tov once said that everything that one sees and hears contains a lesson. Sometimes these lessons come to us in words we read in the daily newspaper. Yesterday I read the words of David Hatuel, a father in Eretz Israel whose pregnant wife and four young daughters were murdered by Arab terrorists. At their funeral he cried out, "I beg forgiveness for not giving you enough time." This father’s words enter our heart and remind us that our time in this world is only temporary. The lesson of these words is obvious. Never take for granted the preciousness of the time you have with your family. Nothing is more important. Rabbi Chaim Vital wrote, "When a person faces his judgment in Olam Haba, he is not evaluated according to how much he helped other people. He may be a tremendous activist, may be constantly running from one affair to another, may be constantly involved in one project or another, but his worth is measured according to how he behaved with his spouse and children. The way a person acts with his family reflects who he really is." Please know that I will always be there for you. You can always talk with me and I will listen. Nothing is more important to me. May the Ribbono shel Olam always have nachas from you little one. There are two ingredients to raise wonderful children: fifty percent tefillah and fifty percent shalom bayis. It is shortly before dawn when Yaakov encounters the angel, they wrestle, and ultimately Yaakov overcomes the angel - when suddenly the angel remembers that it has to leave. How can it be that the angel only now remembers that it has an urgent appointment to sing shira before G-d? Chazal tell us that angels only sing shira once in their existence; surely this angel had this date marked off on its calendar for some time. How could it could decide right before that appointment that it would try to get its black-belt fighting Yaakov? It certainly seems like odd timing. It was specifically its defeat that accomplished the angel's ultimate mission, and caused it to sing shira to G-d. Ultimately, the angel was only successful when it was defeated by Yaakov. We live in a world of discord. We see people fighting on many levels - and unfortunately, it often seems unfair, as good people suffer and less-than-good people prosper. But it is encouraging to know that there is a master plan, and we are but small players in that plan. In the end, good defeats evil, and evil is ultimately pleased to be defeated - for that is its role. A Chassidic melody fortifies hope and trust, brings joyousness, and places the home and family in a state of "light." "Once only, does there wander into each man's life a person possessed of virtue, embodying a spirit of gentleness, faithfulness, and yet the highest degree of joviality. Four years ago, we are proud to say, we were honored with just such an acquaintance. Character of the highest caliber was not the only asset; behind his smiling countenance there lurks an ever-present vigilant sense of judgment developed to such a degree as to enable a coping with life's most delicate and intricate problems. With a disposition ever so calm, "Doc" is known to all of us as a regular fellow with great capabilities and rare qualities of friendship. We are sure he will be held in high esteem by his associates of the future as he is by us, his associates of the past." At a very young age people referred to my grandfather him as "Doc" since he always expressed a desire to be a doctor. After graduating from college, my grandfather attended medical school at Temple University and officially became a doctor in 1934. In July 1942, my grandfather enlisted in the army after he learned about the Nazi's persecution of Europe's Jews. 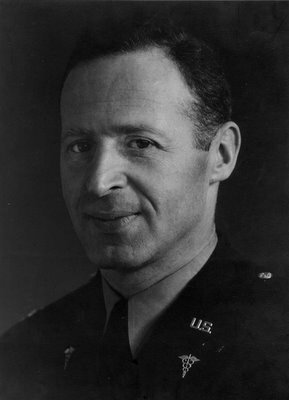 Although he expressed a desire to sent over to fight the Germans, he spent World War II stationed in army hospitals in New York, Florida, and Indiana. During the last year of his life, my grandfather was bedridden with emphysema and Alzheimer's Disease. While he could not remember what happened five minutes before, he could recite medical text books from memory. Even during his final days when he was dependent on the care of my grandmother, he would ask everyone who came to visit him, "Do you need anything?" "Do you need anything?" - these four words sum up my grandfather's entire life; a life devoted to caring for other people. Today, on the day of his yahrzeit, may his neshoma be a meylitz yosher for us all. Please - please do not raise your voice at any human being; a human being is precious, so precious. My three year-old daughter goes to a Chabad nursery school with a little girl named "Michal". Michal's mother is Jewish and her father is a devout Irish Catholic. Fortunately, Michal has a caring Jewish grandmother who sucessfully convinced the Irish Catholic father to send Michal to the Chabad nursery school by explaining that it was considerably cheaper than other nursery schools in the area. Although Michal attends a Chabad nursery school, she returns home to a house full of Christmas decorations and is fed ham and cheese sandwiches by her parents. One day as Michal got ready to leave school, she turned to her teacher and said, "My daddy is going to pick me up now and take me to go sit on Santa's lap." Michal's story, like the story of Binyomin, makes me want to scream. Although the parents may have the best intentions, they are raising their children in a manner that will ultimately obscure the essence of the child's being. With Chanukah approaching, may Hashem have rachmonus on children like Michal and Binyomin and help them so they will not be lost in the great American melting pot. G-d answers our pleas not to suffer His chastisement by exacting payment from us in small doses…we can look upon our small problems and frustrations as a blessing in disguise, knowing that Hashem in His mercy has softened our suffering. Where In Jerusalem Is Asher? During our phone conversation last December, Asher proved to be an amazing source of genealogical information. He told me that he even still kept the Yiddish letters from his grandfather Shmelik (my great-grandfather's brother) who immigrated to the United States in 1921. At the end of our half-hour conversation, Asher told me that he would send me a long detailed letter about our family after he and his wife moved to a new apartment in Jerusalem the following week. Given the warm tone of our conversation, I expected that to receive the first letter in a month or two. After twelve months, I still had not received a letter and I wondered whether he lost my contact information in the move to the new apartment. Last week, with the help of my friend Yitz of Heichal HaNegina in Jerusalem, I was able to find Asher's new address and phone number. I quickly called Asher's new number and we spoke on the phone for a half-hour and caught up. Asher is now 91 years-old and has trouble hearing. At one point in the conversation he needed to call his wife to get on the phone with us to help him understand what I was saying. 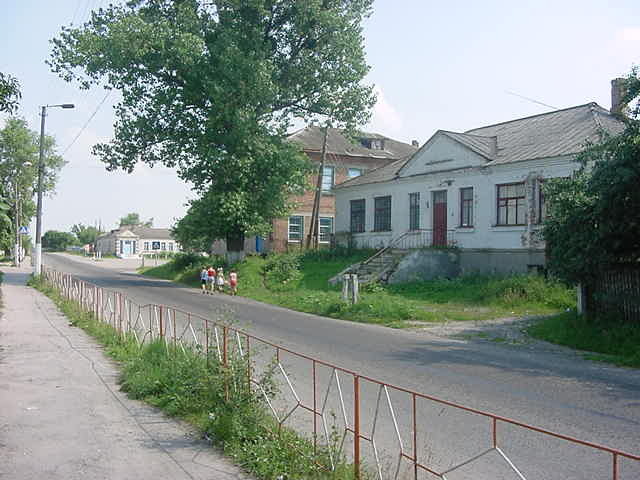 In 1920, Asher moved from our family's shtetl to the larger city of Rovno when he was only five years-old, nevertheless, he still has a faint recollection of his birthplace. He remembered that his house was located in the main square in a building where his maternal grandparents ran a small grocery store. 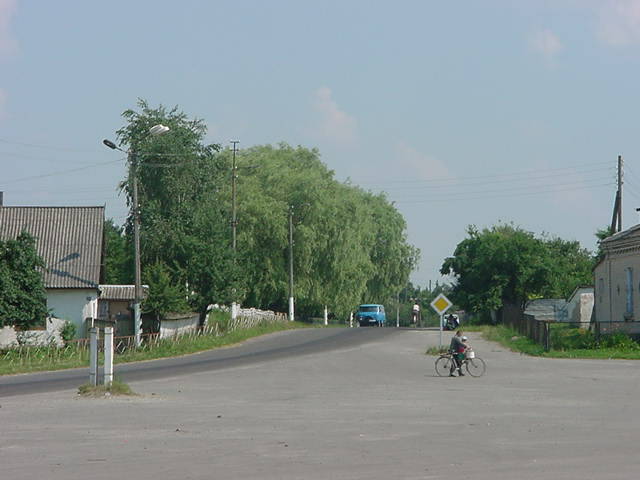 Before ending our conversation, I told Asher that I would send him some pictures of what the main square looked like during my visit in 2001 so he could try to identify the location of his house. Since he has difficulty writing, I plan to call him back in a few weeks after he has had a chance to look over the photographs. Between World War II and a fire in archives building in April 2003, many of the records from my family's shtetl have been destroyed. Along with the photographs, I sent Asher a number of question about our family's history. Asher remains my only hope in breaking through the genealogical brick wall. When you do something in public, determine whether you would do it closeted in private in the same manner that you are doing it in public. If the answer is yes, then your deed is perfect. Rashi, commenting on Bereishis 26:34, states that Esav snatched women from their husbands and raped them for the first forty years of his life. In the next verse (26:35), Rashi comments that Esav and his wives worshiped idols; a source of great distress to Yitzchak and Rivka. In Bereishis 27:3, Yitzchak instructs Esav to sharpen his sword and go out to the field to catch game for him to eat. Bereishis Rabbah 65:13 notes that the reason why Yitzchak asked Esav to sharpen his sword was because a blade with an imperfection is unfit to use for slaughter. While Yitzchak did not eat the food that Esav slaughtered on this occurrence, the Torah tells us that on an earlier occasion (Bereishis 25:28) that Yitzchak loved Esav "because his game was in his [Yitzchak's] mouth". - thus seemingly implying that Yitzchak ate the meat Esav slaughtered. Since we know that Yitzchak Avinu was a man of great spiritual sensitivity, how could he eat meat slaughtered by someone like Esav? Because an animal's soul is present in its blood, human beings are forbidden to consume the blood, for the base animalistic traits are contained in it and would thus defile the person who ate the blood. Man's soul aspires only upwards, towards G-d in Heaven, while the souls of all the other creatures are drawn only to the earthly, physical plane. A Chassid and a Misnaged were sitting next to each other in front of an open Gemara, learning together in chavrusa. The chassid looks over at the Misnaged and excitedly says, "Do you see this!!!? It says, 'They said about Yonason ben Uziel, that when he sat and studied Torah, any bird that flew over him burst into flames.'" The Misnaged, apparently not impressed, responds, "Nu, so what is your point?" The Chassid repeats the line once again, "They said about Yonason ben Uziel, that when he sat and studied Torah, any bird that flew over him burst into flames." Sitting stone-faced, the Misnaged responds, "So......"
Exasperated at his chavrusa's indifference, the Chassid explains, "Can you imagine the deveykus of this tzaddik?? He learned with such intensity and fervor that a pillar of fire shot out of the sefer before him and incinerated the birds flying over him! You are not impressed with this??" The Misnaged responds, "Why would I be impressed with this?? I want to know whose birds they were and how much the owner gets in damages!" Bodily health and well-being are part of the path to G-d, since it is virtually impossible to know or understand anything of the Creator if one is sick. One must therefore avoid anything that may harm the body, and cultivate healthful habits. On Monday, I took my three year-old daughter and 18 month-old son over to my friend's house to play with her three year-old daughter. Although my friend's husband is Jewish, she is not, and her house is full of Christmas decorations. My daughter and son were admiring the pretty 'holiday" decorations that were up around the house but had no idea why the decorations were in place. They just thought the lights and the tree were pretty. When my daughter saw a frame picture of her little friend with a man in a red suit, beard, and funny hat, she turned to my friend and asked who was in the picture with the little girl. Meanwhile, my 18-month old stood there and waved at the picture; convinced that any man with a long beard had to be a rabbi or somehow related to Uncle Moishy. My friend looked at me with a look of astonishment. How on earth could my three year-old not know the name of the man in the red suit? My friend responded, "Wow! You are doing a great job with your kids." It wasn't until this experience did I realize how "Jewish" of an environment we have created for our children. It has showed me the importance of having two Jewish parents (especially the mother) to teach children about their heritage. Have you any idea why our sages chose to have the chassan say at the moment of taking a wife, ‘You are sanctified unto me’? The Gemara does list other possible statements, such as, ‘You are engaged to me’, ‘you are a wife unto me', and so forth. They chose this phrase to remind the chassan that marriage must be entered into with holiness and purity. Should he think otherwise, even the deepest inferno is insufficient for him. A tremendous act of chessed. 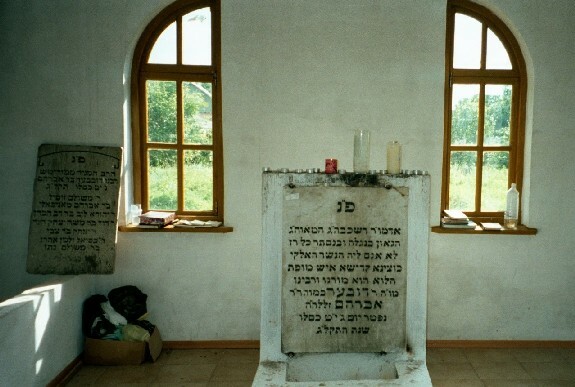 I visited the kever of the Baal Shem Tov in Medzhebuz, Ukraine four years ago, but it wasn't until I returned home did I realize that I had missed visiting a major site located in another part of the town; the Baal Shem Tov's Beis Medrash! 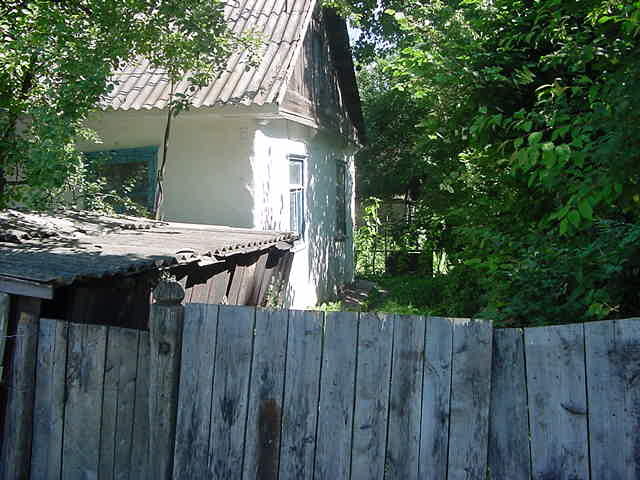 In October, Rabbi Aryeh Wohl sent me an article he wrote for Olam HaChassidus magazine that mentioned that when the Degel Machaneh Ephraim left my family's shtetl during the last year of his life, he settled in Medzhebuz and davened in this beis medrash. Four years ago, I must have been a only few steps away from this place where the Baal Shem Tov and Degel Machaneh Ephraim davened, and yet I missed it! Reading 'laizer's narrative on Wilderness City and Rabbi Gedaliah Fleer's new book Against All Odds have heightened my feelings of regret for not visiting the beis medrash in Medzhebuz and Rebbe Nachman of Breslov's kever in Uman. I also long to visit my family's shtetl for a second time and visit some places that I did not get a chance to see, such as Berditchev, Breslov, Rovno, and Ostrog. Deep in my neshoma I know that I need to return to Ukraine once again. On his journey to Eretz Israel in 1798, Rebbe Nachman of Breslov said, "I cannot tell you the reason for my journey, for my heart has not even revealed it to my mouth." I can sense that there is still a missing piece remaining to be uncovered in the land of my ancestors; a piece that will help me discover who I am and why I am here. Experience has taught me that nothing truly good comes easy. All to often we struggle in our youth to achieve goals to live by, but the older we get, the more we fall into the trap of predictability and repetitiveness. We stop breaking new ground. But G-d is infinite and there is no end to what we can experience of His goodness. All we need to do is transcend our self-imposed limitations and be willing to give up some of the comforts we have grown used to. Then when a difficult mitzvah comes our way, we can make room for G-d to enter our lives at a deeper level. As long as there is constant growth and renewed vitality in our relationship with G-d, there is nothing to fear. For the past two months, I have been corresponding via e-mail with Rabbi Aryeh Wohl of Ramat Beit Shemesh, Israel who is a direct descendent of the Degel Machaneh Ephraim. While visiting Boro Park last Thursday, he called me on his cell phone and we finally got a chance to talk. It was an absolute pleasure to talk with someone with authoritative knowledge of the Degel's life and teachings. When I asked him what Chassidus today was the truest to the path of the Degel Machaneh Ephraim, Rabbi Wohl answered with one word; Breslov. He then cited the numerous similarities between the seforim Degel Machaneh Ephraim and Likutey Moharan. Before we ended our conversation, he said that he would like to meet me and referred to me as a "Sudilkover chassid". When I told him that I was not yet a chassid, he replied, "A streimel, golden coat, and tall white knee socks doesn't make a chassid. You are a chassid because you learn the seforim of Chassidus and seek to follow its path." The guidance I have received from Rabbi Wohl, Rabbi Brody, and Rabbi Sears has helped illuminate the way back to the path of my ancestors. It now is up to me to continue this journey. Even if you do not understand every passage, do not understand, do not stop learning, since at the very least they are setting forth on the path of holiness, the path of Chassidus. You will understand as much as you can. Beyond that, the words and holy spirit within them will cling to you and will purify you. Around this time every year, I am driven to find a place inside during my lunch break because of the cold weather. During the warmer months I spend every lunch hour on a park bench learning next to a memorial made from cobblestones from the Warsaw Ghetto. I stare down at these cobblestones when I finish learning each day. 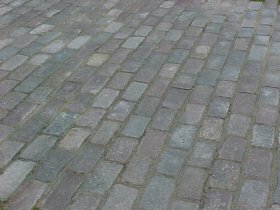 Despite the fact that these cobblestone seem out of place in their North American surroundings, I try to imagine them in their former location and I think about all of the people who walked over these cobblestones before being sent to the gas chambers in Treblinka. Every day for the past few years I return to this park bench and learn. Perhaps one day I will learn why I am drawn there and what my learning accomplished in this place. Every day, every child, after studying the daily lessons prescribed by our sages, should learn about the Holocaust, for it says in our holy Torah: "Then it shall come to pass, when many evils and troubles are come upon them, that this song shall testify before them as a witness." (Devarim 31:21). The suffering and the testimonies, when told by Holocaust survivors, are a song, a hymn of praise, a testimony to the eternity of the Jewish people and the greatness of their spirit. There are many shuls where I live, and this past Shabbos I finally went to a big old shul with a silver dome on top to hear the famous cantor, Chazzan Ben-Tzion Miller. This was a big attraction in my community since it was a Shabbos Mevorchim and the chazzan says the special tefila for the new month. While I have never listened to much chazzanus and find it to be very foreign, I was almost moved to tears by listening to this world-class chazzan recite the prayers. As a chassid who is accustomed to shteibelach and Chassidishe shuls, it was strange for me to find myself in a very large old building with a carpeted floor, old wooden pews, a domed ceiling, three huge doors from which to enter atop numerous stone steps, stained glass windows, balconies for the women, a stage with seats for the chazzan, rabbi and president (but no Rebbe). I never thought I would find this type of atmosphere to be inspiring, but surprisingly I did. I also thought about the numerous chazzonim and shuls of this kind that once existed, and how few are left today. Will chazzanus continue, or is this a dying gasp of a no longer relevant relic? Prayer should not be a spectator sport; prayer is about serving G-d. Prayer is personal, and should be intensely so - and it is argued that for this reason Chazzanus may be antithetical to the true intent of prayer. Nevertheless, I left the shul wondering if I was disloyal to my Chassidic allegiances - as Chassidism traditionally opposed this type of Judaism, and yet, I found it to be inspiring. I don't know; technically Chazzanus is music, and it's purpose was to inspire the congregation. Could it be that appreciating Chazzanus today may indeed be Chassidic? As R' Hillel of Paritch taught: "He who does not appreciate and understand song, can really never understand Chassidus." A Jew is a human being in touch with his inner essence and possessed of the ability to unveil it, and bring it forth. How does one connect with one's inner self, one's highest levels of soul, above all, wisdom and comprehension, and then reveal it in a mundane, finite world? This can be accomplished through song.